John Michael Huff was born on December 29, 1932 in Walla Walla, Washington, the ninth of ten children born to Andrew Elick and Marguerite Delphine (Nibler) Huff. During his early childhood, the family moved around northeastern Oregon between Heppner, Hermiston and La Grande. When he was about five years old, the family left eastern Oregon and moved to The Rose City. They stayed for a time with his father's sister, Nettie, before the family moved to Tobias and later to a house on Walnut St. in Hillsboro. In 1940, his parents purchased a farmhouse on an 11 acre strip of land on the south border of Shute Park. John's schooling got off to a rough start. Being born in December meant he started school at St. Matthew's Elementary School at the age of seven. However, he came down with Scarlet Fever and had to repeat the first grade. This made him one of - if not - the oldest pupil in his class. John went on to attend Hillsboro Union High School, Hilhi. His senior year he stopped two boys from teasing a girl after her fiance' was killed while he was changing a flat tire. A month before graduation, John was drafted by the U.S. Army. He was able to extend his report date until after graduation. At yearbook signing, during the last month of his senior year, the girl John had "saved" asked him to sign her book. John wrote a short poem, the last line read "someday you'll wear my ring." After that the two exchanged names and phone numbers. They had their first date after the Baccalaureate, John took her to a soda shop next to the Hill Theater. Three days later, he proposed. Again, John's report date was extended until after his wedding. On August 1, 1953 at St. Matthew's Catholic Church, John married Kathleen Ruth McCracken. After a quick honeymoon, John reported to the U.S.Army on August 5th to begin his service. After completing basic training, he was deployed to Germany where he spend the next year. During night maneuvers, John and the rest of the men were ordered off the road and into a ditch. John's knee was injured when it struck a large rock. After a stay in the hospital, John returned to the States. He received an honorable discharge. Once back home in Hillsboro, John began his career as a meat cutter. Like his father before him, John moved his young family around the state of Oregon while pursuing his meat cutting career. By 1962, the couple had their seventh child, their family was complete. A year later, in 1963, John moved his family to Sacramento, California, to be near Kathleen's family, with the intention of settling there. However, in June of 1968, after being laid off and unable to find work, John was forced to declare bankruptcy. The family moved back to Oregon to start over. They lived next door to John's parents and eventually built their home on the 7th acre in what the family called "the lower pasture". In August of 1972, a year after moving into their brand new house, John and Kathleen's oldest son, John Michael Huff, II, was found dead at the vocational school he had been attending. In 1975, John and Kathleen brought John's father, Elick, home to spend the remaining months of his life being cared for by family. Two years later, on the night of December 23rd, Kathleen suffered a heart attack and died. John was devastated. Two months later, John moved out of his home and in with his new lady friend, leaving behind his sons Matthew and Anthony and daughter Bonnie. A year and a half later, he returned along with a new lady friend and her two children. In the summer of '80, John moved his mother, Delphine, into his home so he could look after her with the help of his sisters. On January 1, 1984, John married his lady friend Joyce. In May of 1986, John's mother, Delphine, died in her sleep. Two years later, John sold his house that "no longer felt like a home but a mortuary" (his words) since his wife and parents died in the house. At the insistence of his current wife, they bought a house on SW 25th Ave in Hillsboro. In 1995, they sold it, again at her urging. They bought a motor home with the intention of moving to Wyoming to start anew. Instead, while John was visiting his daughter in Gold Beach, Joyce abandoned him, taking everything they had in storage and all but wiping out their bank accounts. The couple divorced in 1996. Once again, John had to rebuild his life. Opting for a change of scenery, John moved his motor home to Gold Beach and swore he'd never marry again. At the urging of his daughters, Tamera and Michael Anne, John attended a Halloween dance at the senior center in Brookings, Oregon. There he met a woman who brought a spark of joy back into his life. On August 8, 1999, John wed Sharon Lee Rodgers. The couple settled in Brookings on the southern Oregon Coast. Their happiness was rocked when eight years later, in December of 2007, John was diagnosed with Alzheimer's disease. Sharon retired from her job at Century 21 Agate Realty a year earlier than planned so she could spend as much time as possible with John. As his condition worsened, her love for him never wavered even though he couldn't express his love and gratitude in return. On the evening of March 28, 2016, while sitting with Sharon, John began speaking gibberish. Concerned, Sharon asked him if he was okay and he replied, No. She asked him if he was in pain. Again he said, no. She called 911. John was immediately taken to the VA Hospital in Crescent City, just over the border in California. John had suffered a stroke. He was no longer ambulatory. At first it was believed he would get better, as he had before when a stroke affected his right arm and leg. However, on March 30th, it was discovered he could no longer swallow. The next day he was transferred to a nursing home in Brookings and placed on Hospice. On April 2, 2016, with his wife holding his hand and several of his children, step-children and a grand-daughter present, he drew his last breath and slipped away. 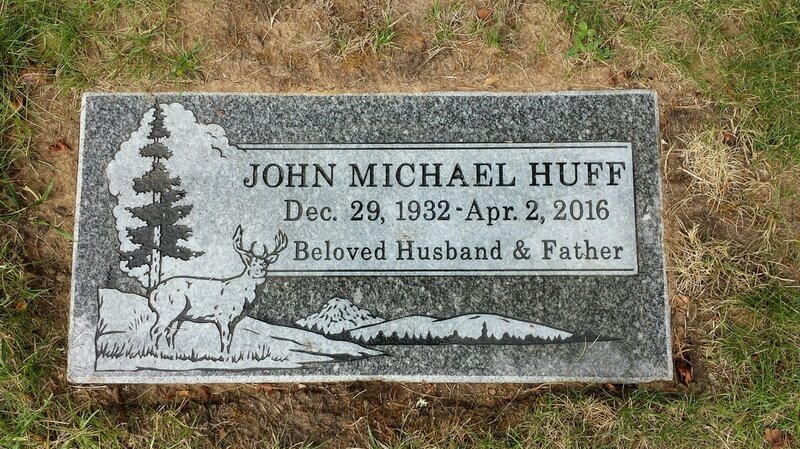 John's ashes were interred with his son, John Michael Huff, II, in Fir Lawn Cemetery, Hillsboro, Oregon.